Quirky NY Chick: Arc Angels At Irving Plaza This Friday! Arc Angels are making a stop in New York this Friday, May 8 at Fillmore Theater at Irving Plaza! For those that aren't familiar, Arc Angels formed back in the early '90s, released a really good self-titled album, Arc Angels, in 1992 which drew critical acclaim and their live performances gained them a legion of devoted fans. In 1994 they split up. The members went their various ways working with a bevy of legendary artists (Eric Clapton, Bob Dylan, Buddy Guy etc.) as well as crafting some excellent solo works. 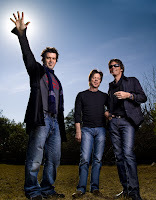 This year, original members Doyle Bramhall II (lead guitar/lead vocals), Charlie Sexton (lead guitar/lead vocals), Chris Layton (drums) officially reunited at Austin's SXSW Festival. Now that they've reunited, they're doing a U.S. tour this summer as well as recording new music. If that's not enough, they plan on releasing a live CD/DVD later this year as well. See there, lots of stuff to look forward to. So, if you're in the NYC area, grab a ticket and check them out at Irving Plaza this Friday. I believe this is their only headlining gig outside of Austin before they take off to the UK for a string of shows opening for Clapton. Click on the image to see video footage of Arc Angels.